All the bred ewes lambed. Just fine. Every one of them a popcorn king or queen. Zippity-do-dah! And then, Clara, twin of Bridget, mother of Toby-Joe, quietly gave birth to a little girl yesterday. A stunning little girl. Cream and black, like one of those tender filled licorice candies. Okay. I thought, okay. Clara, who last year refused to let Toby-Joe anywhere near her, seemed to be accepting this new little ladysheep. Cooing to her. Walking her around. Talking to her. Bringing her to the hay with the other lambs, so she could eat her dinner. Last night, I was concerned, but not terribly worried. I hadn’t seen her nurse, but the lamb hadn’t left her side. This morning, though, she had distanced herself. The lambess was laying down in the middle of the dry lot, shivering, sleeping, alone. We brought her in. I wrapped her in a wooly blanket. Made some colostrum for her. Slow going. She’s taken little more than an ounce so far. I know that ewes abandon “defective” babies. 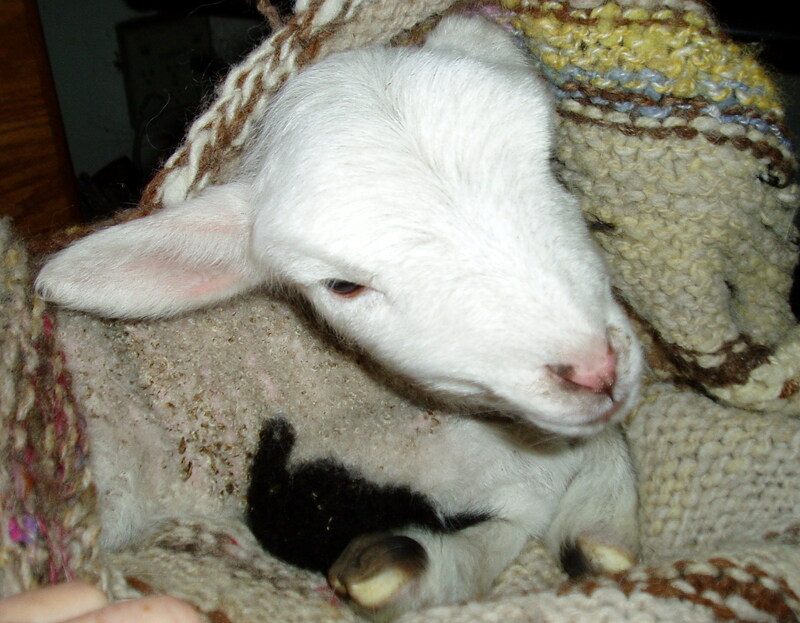 I know, because I have raised several bottle babies, and a truly strong healthy lamb is the exception. Right now, it’s too soon to tell if this little one will make it. We’re having a chilly day, but if I can get her fed and rested and warmed up, I’ll return her to her maa. And go out there with a ba-ba as often as need be. Boy o boy. The adventures never stop.